Subject: LongIsland.com - Your Name sent you Event details of "2nd Annual LI Running Companies Prediction Run & Turkey Drive Challenge"
Help your local independently owned running stores alleviate Long Island hunger this holiday season. 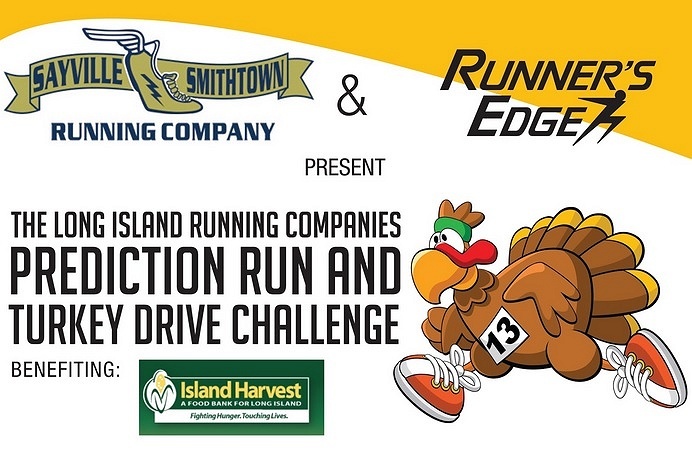 Runners Edge and Sayville and Smithtown Running Companies are teaming up with Island Harvest Food Bank for a fun run and turkey drive. Please make a turkey donation and join us for a four (4) mile Prediction Run, on the trails of Babylon, where you can win by guessing your finish time most accurately, not by running the fastest. Awards to the top ten predictors. When: Saturday, November 19, 2016. 9:30am Check-in. Cost: Free to all runners and walkers who bring a frozen turkey. If you can’t bring food, a monetary donation is requested (minimum $20). Free pint of craft beer and hoagies to all donors.